New survey reveals: Who are Virginia’s Metro riders? Virginians who ride Metro are likely to make more than $75,000 per year at jobs with private companies, a new analysis of Metro survey data suggests. The survey also shows that more Marylanders ride Metro on weekdays than people who live anywhere else. 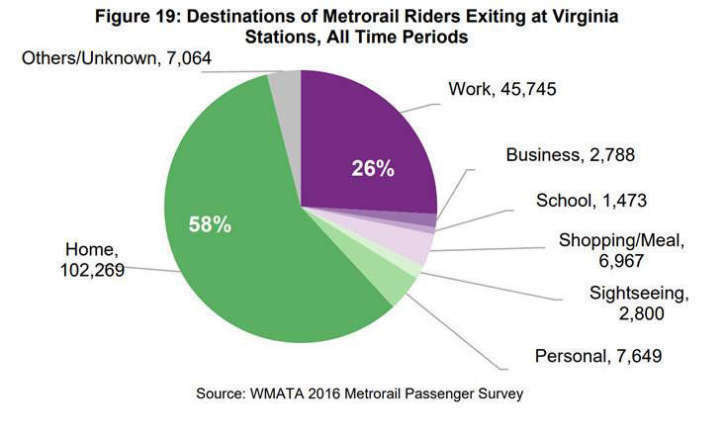 WASHINGTON — Virginians who ride Metro are likely to make more than $75,000 per year at jobs with private companies, a new analysis of Metro survey data suggests. The survey also shows that more Marylanders ride Metro on weekdays than people who live anywhere else. The Northern Virginia Transportation Commission review of a Metro rider survey taken in early 2016, before round-the-clock track work began, suggests 37 percent of Metrorail weekday riders who live in Virginia work for the federal government, and slightly more than half of the Virginia riders live in households earning more than $100,000 per year. According to the survey, Virginians make up about 30.5 percent of weekday Metrorail riders. D.C. residents make up around 30 percent, and Maryland residents make up about 37 percent. People who live outside the District, Maryland and Virginia make up about 3.5 percent of riders on an average weekday. About 35 percent of Maryland weekday riders and 24 percent of D.C. riders work directly for the federal government. Rail riders in the District are less likely to live in a household making at least $75,000 per year, compared to riders in Maryland or Virginia. Nearly three in four weekday trips by Virginians are in the morning or afternoon rush, mostly by people who live in Arlington, Fairfax or Loudoun counties or the cities of Alexandria, Fairfax and Falls Church. Other riders come from areas like Fredericksburg on VRE, commuter buses or Interstate 95. Commuter buses from areas like Prince William and Loudoun Counties also drop riders in D.C. at stations like L’Enfant Plaza where they transfer to Metro to get to work. Riders like that are part of the reason the District has challenged current Metro funding formulas. The local bus hub at the Pentagon amid a sea of Department of Defense parking lots makes that station the most heavily accessed by bus during the morning rush. East Falls Church, with a relatively small parking lot and right off a heavily trafficked bike trail, has the highest percentage of Virginia riders getting to the station by personal bike or Capital BikeShare during the morning commute. Driving alone to the station is most common at end-of-line stations with large parking lots, such as Franconia-Springfield and Vienna. Walking to stations is more common in the more densely developed areas of Arlington and Alexandria. Metro’s 2016 survey received 62,041 valid responses that were weighted against Metro’s then-average weekday ridership of 666,650. Ridership declined further over the past year, but has since shown slight signs of a plateau. Metro uses the survey data in conjunction with census statistics to determine the acceptable impacts of service changes on low-income and minority groups. The regionwide 2016 rider survey estimated 45 percent of rail trips were taken by members of minority groups, and 13 percent of rail riders are low-income. On Metrobuses, an estimated 81 percent of trips are taken by members of minority groups, while an estimated 52 percent of riders are low-income. Those ratios are higher than when Metro had last conducted the survey in 2012. The older data was used to measure the impact of fare hikes and service cuts that were implemented in June.